J. J. Taylor Companies, Inc.
1st annual (2005) T-Shirts & Tank Tops - reduced prices. We have t-shirts that remain from our 1st annual event that occurred on July 10, 2005. We are selling them for the reduced price of $5.00. You can order t-shirts on-line by clicking here. 2nd annual (2006) T-Shirts & Tank Tops. We have t-shirts that remain from our 2nd annual event that occurred on July 16, 2006. We are selling them for the reduced price of $10.00. On-line ordering has not yet been set up. To purchase 2nd annual t-shirts, please contact us at (651) 649-4404 or email us marcb2@chucksride.com. Tumblers, Window Clings, Pens and Bandanas: These cool items have the "Ride for Wishes" logo printed on them. 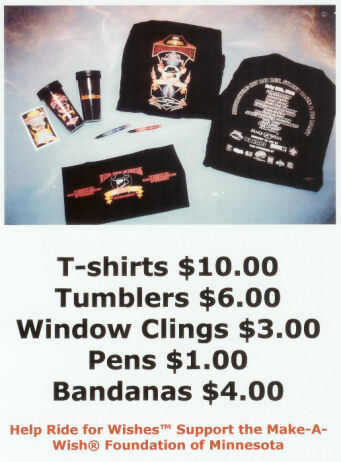 To purchase any of these items please contact us at (651) 649-4404 or email us marcb2@chucksride.com.